Home News We’ve won #TIBA! 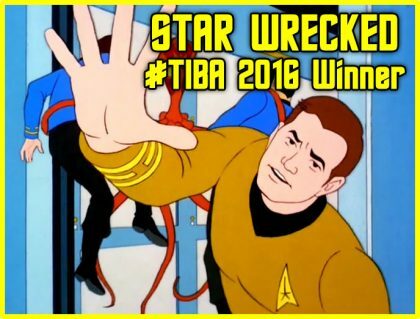 Announcement time… we won #TIBA!!! It’s official, we are the winners of Team Four Star’s Tenkaichi Ironman Budokai Abridgathon! It is a massive honor to receive top prize in the first ever #TIBA tournament! We are thrilled and flattered to accept this award with such strong competition. With the success of Star Wrecked, you can rest assured that you haven’t seen the last of Enterprise and crew. You can hear the judge’s reviews over on the TFS event page. Thank you to the judges and Team Four Star for giving us this opportunity, thank you to our cast for being as amazing as you are, and thank you to everyone who supported us through this competition! Just because #TIBA is over, doesn’t mean the entries are either. There’s some amazing work out their that the community brought to this tournament. Once again, thank you so much for the love and support, from everyone here on Team Slap! Now it’s time to get back to editing and we’ll see you for Episode 18 of ASOT.